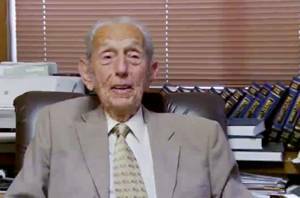 Harold Camping announcing the imminent rapture in 2011. That was the question posed to a group of believers gathered around a radio preacher who predicted the end of the world in 2011 in a unique experiment carried out by a team of economists. At the recent conference of the Association for the Study of Religion, Economics, and Culture in Washington, DC, which Religioscope attended, economists Ned Augenblick (University of California), Jesse Cunha (Naval Postgraduate School and University of California), Ernesto Dal Bo (University of California), and Justin Rao (Microsoft Research) presented a case study of radio broadcaster Harold Camping of the evangelical Family Radio network, who predicted that the rapture would occur May 21, 2011, with the final end of the world arriving on October 21 of that year. Camping, the co-founder and president of the large radio network, based his predictions on numerological interpretations of the Bible. To understand the motivations and the “costs” followers of Camping were willing to pay for their end-times beliefs before and after these dates, the researchers set up an experiment where they offered those attending a seminar on Camping’s teaching to demonstrate their confidence in the predictions. They were given the choice of receiving a payment of five dollars immediately or the chance of receiving a much larger payment payable by check in four weeks time (a future date intentionally set post-May 21). The researchers conducted the experiment among 23 Family Radio (FR) members and used a control group of 29 subjects from the Seventh Day Adventist church (SDA), which was started by the end-times predictions of founder William Miller. The SDA members were similar to the FR members in many aspects but did not share a date-specific judgment day belief. All of the FR members, except for one, were willing to forego larger payments in four weeks for receiving five dollars immediately in their belief that the rapture was imminent. This behavior was consistent with surveys where 100 percent of FR members said they were certain that the rapture would occur on May 21, 2011. When that event did not occur on that date, the researchers examined Internet message boards and found that followers of Camping tended put forth alternate future dates for the rapture. Following the passing of each new predicted date, a new revision was immediately suggested and the group coalesced on that date. This re-setting of dates after a failed prophecy is fairly typical of end-times and apocalyptic groups, according to the researchers. These revisions continued until Camping announced on May 23 that a “spiritual judgment” had indeed occurred. The paper concluded that the evidence indicates a sincere belief in the end of the world and future prophecy on the part of FR members, ruling out an “external profession of beliefs…driven by exclusively social motives” or evidence-based beliefs.